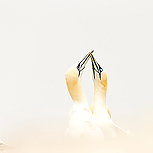 Amongst the greatest wildlife spectacles to be found around the coastlines of Britain and Ireland are our breeding seabird colony’s, and combining two island locations just 40 miles or so apart but accessible from Ireland and Wales respectively, this trip looks to cover as many species and settings as possible. Our Irish island hosts a fantastic Gannet colony along with multiple auk species, Kittiwakes and Choughs, all very accessible and with specially arranged early morning and late evening crossings scheduled we will be able to work in the very best light: we’ve once again added an additional day here this year from our early trips here to really make the most of this opportunity. Back in Wales we will be staying on one of the UK’s premier islands for Puffins, again allowing us the opportunity to photograph in the optimum lighting conditions: evening lighting here is amongst the best for photographing these enigmatic birds anywhere in the UK. We’ll also have the opportunity to experience the night time visit of the elusive Manx Shearwater. PLEASE NOTE: At this stage these dates are provisional only as some aspects of accommodation cannot be 100% confirmed until the autumn. We will let you know straight away once they are confirmed. Day 1: The ferry leaves from Fishguard, Wales to Rosslare, Ireland around lunchtime and the duration is around four hours. We will make our way to Kilmore Quay where we will check into our B&B accommodation and enjoy an evening in a local restaurant. Days 2-3: We will leave early for Great Saltee Island by pre-arranged boat with a local fisherman, taking our food and refreshments for the day with us. We will not be returning until the evening light has gone so be prepared for a full day out when the weather may change. Packed refreshments will be available for you to order the night before. Please note that the landing on the island is a wet landing: we will transfer from our fishing boat to a smaller craft (Zodiac) and then need to exit this into the shallow waters – bare foot, Wellingtons or waterproof sandals (best option) are the options available for you, and they can be left on the shore to switch to your more conventional light walking boots. 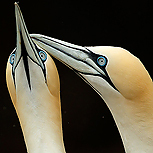 Great Saltee is one of the premier locations for photographing seabirds and we will get the chance to photograph guillemots, razorbills, kittiwakes, fulmars and an excellent gannet colony. Day 4: We are again scheduled for an early start for Great Saltee Island for a full mornings photography building on the previous two days, but we will be departing during the afternoon to return to the B&B, collect our bags and head to Rosslare for the evening ferry. We’ll eat on board and are due to arrive in Fishguard late in the evening which we are then booked in a local hotel. Days 5-7: The early mornings continue as we head straight to Marloes (about an hour’s drive) to catch the passenger boat out to Skomer. This island will be our base for the next two nights in the accommodation hostel in the centre of the island, and we’ll have the best opportunity to photograph early and late light puffins, the magnificent bluebell display on the island and a night time visit of manx shearwaters too. You’ll be free to leave the island on the boat of your choice on the last day – this will be between 10.00 am and 15.00 hours so the choice is yours dependant on the weather. Ferry to Ireland, all travel (excluding local transfer in Wales), accommodation, meals, boat trips and entry fees. Travel to Fishguard, sundry items and alcohol. Whilst in Ireland, we will be using twin room based B&B accommodation (clean and comfortable) and whilst in Wales we will be using a comfortable hostel style accommodation on our island base and there is no single supplement available. The landings on both islands require a decent level of fitness – one is a wet landing (ie into shallow water) the other requiring a steep climb up steps. On both islands there is a reasonable amount of fairly lengthy and occasionally steep walking on paths and access to the gannet colony requires a degree of walking on rocks. This trip will involve some early morning starts and one potentially long island based day.